An Italian classic made a little more garlicky. 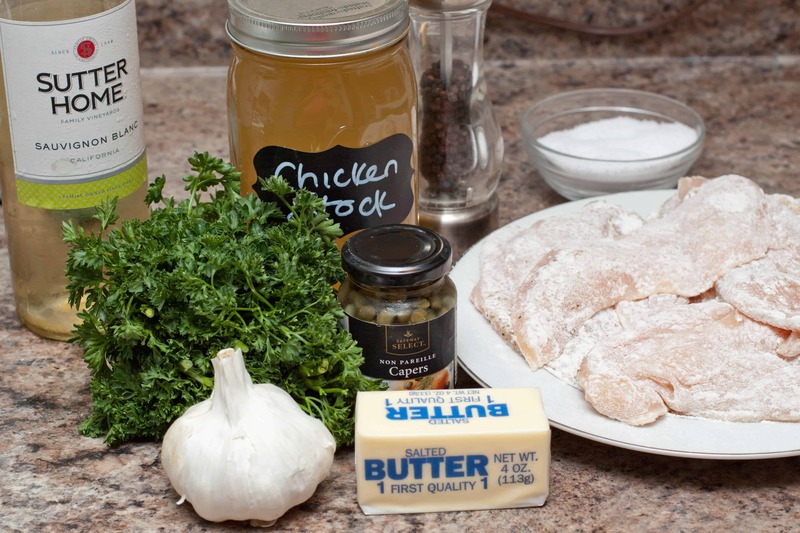 Homemade Garlic Chicken Piccata is easy to make but tastes like much more work! Oh, hello! It’s been a little while, but for very good reason. We welcomed our little girl Matilda to the world last week on June 2nd and, so say the least, we’ve been a wee bit busy. Even as I type this, it’s 3:30 in the morning and I’m connected to an electric (hands free) pump. Life’s been an amazing whirlwind of so many new things – priorities, sleep patterns, and most importantly, love. Love for this new little human beyond what we could have ever expected to feel, and a new love between my husband and I as we venture into this crazy thing call parenthood together as a united front. Even though our priorities around some things have changed (read: “have I showered yet today?” and “I should probably listen to those voicemails that didn’t come from a Drs office…”), one big one that hasn’t changed is our commitment to eating well and as much from scratch as possible. I know, who the hell has time for that when you have a tiny little human who needs to be fed every 2 hrs and changed every 10 minutes? No one. At least not 100% of the time. We’ve succumbed to a take out pizza. We both agreed it wasn’t as good as the pizza we make, but it sure hit the spot at the time. 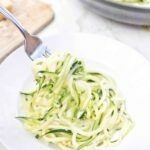 But for a majority of the time, even among the craziness of our new schedules, there are so many delicious ways to eat well while keeping up with diapers. Like this super easy, super garlicky, Garlic Chicken Piccata. Just a few fresh ingredients and although it technically takes awhile to cook, the actual attention time it needs is pretty minimal. A majority of the time required is roasting the garlic, but while it roasted I was able to change at least 2 diapers and pump a bottle of milk. Then it’s an easy one pan dish of deliciousness. Floured chicken breasts with a lemon, chicken stock, white wine, capers, and most importantly, garlic sauce. We served this with some leftover mashed potatoes and an easy green salad. But this would also be amazing with pasta or rice. A deliciously garlicky, easy Chicken Piccata perfect for dinner! Pre-heat oven to 400 degrees. Place the head of garlic on a piece of aluminum foil and drizzle with olive oil. Wrap and roast in oven for 40 minutes. Generously season the chicken breasts with salt and pepper and then dredge the chicken breasts in flour. in Heat the olive oil and butter in a large saute pan on medium high. When the butter melts and begins to bubble, add the chicken. Cook 3-4 minutes on each side until browned. Remove chicken from pan and set aside. Add roasted garlic cloves to the hot pan and add the stock and wine and let cook for 5 minutes. Add capers and lemon juice and cook for another 3 minutes. 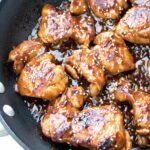 Return chicken to the pan and pan baste the chicken with the sauce. Add parsley and serve over pasta, rice, or steamed vegetables. This looks delicious! 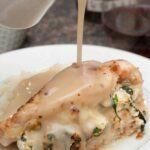 I am always looking for simple, yet tasty dinner recipes, and this looks like it would be great. Congratulations on your daughter too!!! Sooo wounderfull, a new baby,congratulation! Looks like you applied for the job of superwoman cooking from scratch and all? ?Best of luck for your little family! Anyway – chicken & capers! You’ve hit upon a favourite in our household. Pinning for ASAP! This dish looks incredibly good and the recipe sounds looks quite easy to make . Will be trying it soon. Thnx for sharing. Cooking with wine is fun and delicious. Love the pop from the capers. This dish is elegant enough to serve to dinner guests. I will have to give this a try soon….and head out and get some wine too. Chicken Piccata is one of our all-time favorite dishes at our favorite Italian-American restaurant here in town. Can hardly wait to make this at home. Thanks for the great recipe! I love chicken piccata and extra garlic only makes things taste better! 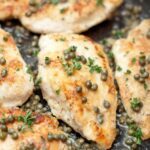 This is one of my favorite dishes, not only because it’s so easy and quick to make but also because I absolutely love capers! I am addicted to them! 🙂 Definitely adding to my menu this week. Congratulations on your little girl! What a busy, but amazing time! I can’t wait to try this recipe. Roasted garlic is a wonderful addition! 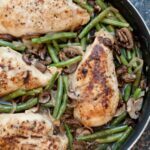 I love chicken piccata, but I especially love garlic, so this is the ultimate chicken piccata for me!! The perfect dinner for any night of the week! 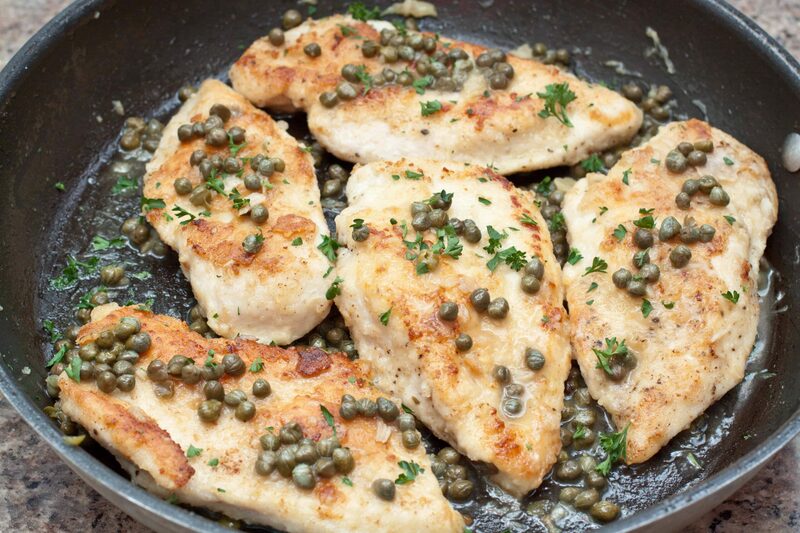 Chicken Piccata is one of my absolute favorites. The more garlic the better, so thanks for kicking up the garlic factor in your recipe! Definitely easy enough for parents or any busy season of life. You had me at “Made a little more garlicky.” Congratulations on your wonderful little bundle of joy (I know I’m a little late on the congratulations chain, but still), and kudos to you for getting anything (let alone this lovely and delicious meal) published with such delightful turbulence in your life. And hey, if there’s a meal that’s perfect for when you’ve got a newborn around, it’s a comforting classic with just enough garlic to metaphorically punch you in the face and keep you awake for a little while longer. Cheers. First of all — congratulations!! Having a new life in the home is amazing. Sometimes you feel as if your heart is close to bursting with love. Now, for the recipe — I don’t think you can ever have too much garlic. The chicken sounds fantastic and the taste I’m sure is amazing. Enjoy your little one — they grow up in a blink of an eye. 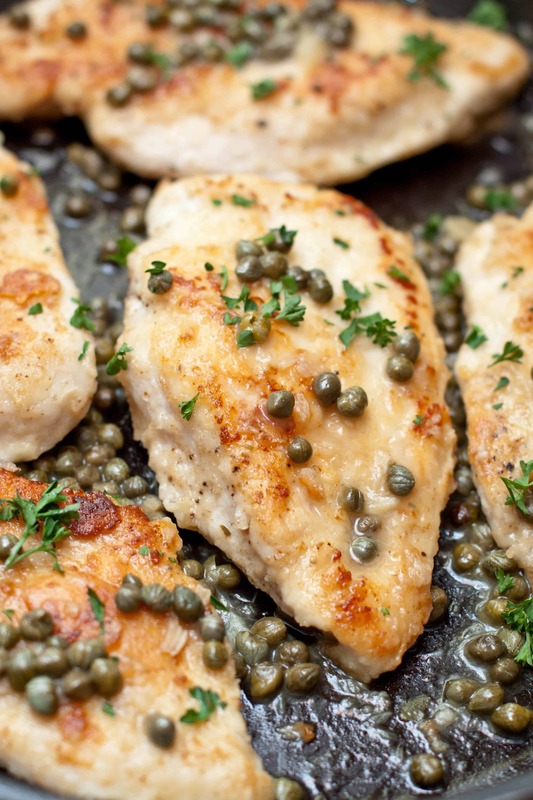 This chicken piccata looks so, so good! I love those briny, wonderful capers and the perfect crust from the pan-fry. Sounds absolutely delicious! I’ve actually been searching for capers to try a recipe similar to this! Once I do, I’m sure I’ll have enough to make this alongside it! I love all the garlic in this since I feel like the more the better! This is amazing! Just whipped it up for dinner, we are on vacation and with limited utensils in an airbnb so I just loved how no nonsense it is, but still with lots of flavor! Looks so delicious and perfect for a quick healthy dinner! Oh my yum! 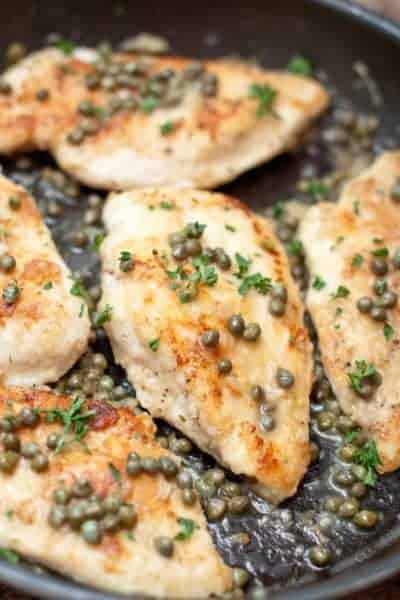 Chicken piccata and then with garlic love this idea easy to make and with so much flavor. No doubt a favorite. Classic recipes are always the best. This was absolutely delicious! Even my picky kids liked it. Only thing I didn’t do was add the capers, but I will next time! Wish I could add a picture of my finished product to show everyone. 🙂 Thank you for sharing the recipe! Congrats on the new baby! How exciting 🙂 This looks like the perfect easy, but flavorful meal, for times when life gets a little crazy. Well if you are cooking with wine, you know it is going to be delicious. Lots of simple flavours creating one awesome chicken dish. Love the pop of those little capers. This would be perfect for entertaining, and you also can finish the wine too. Congratulations on your new addition! When I had mine — we didn’t eat anything but peanut butter and jelly for the first two months! I’m impressed that you have the drive to cook at all. Your chicken piccata looks absolutely perfect — love that golden crust and the whole head of roasted garlic sounds Ah-Mazing! I haven’t made piccata in ages, even though my family loves it. Thank you for the inspiration — I’m sticking my garlic in the oven now! Where was this easy dinner when mine was a newborn??? Ours was born July 2016, so almost the same time! There’s no way I could have changed diapers and pumped while making dinner. But, I didn’t have this easy awesome recipe. LOL! Oh my gosh! So close in age how fun! Which means you’re in the throws of the infamous two, too! We need these easy recipes now for entirely different reasons! I love how simple but delicious this chicken is. I love a good chicken piccata! Congrats on your little one and I love the name that you chose! How do you have time to do it all?! Thank you! We totally lucked out with a little dream baby who sleeps and just chills while I cook! Yum! Roasting the garlic ahead is genius to add so much flavor and not risk burning the garlic in the pan. Great idea!! I love how simple this is to make with pantry staples. Definitely, Debra! I hope you try it and enjoy it! Thanks, Traci! That roasting def makes a big added difference! First of all, I know it isn’t so new anymore, but congrats on the baby!! I want to see some pics!! Second, kudos to you for cooking at all with a newborn. I sure didn’t! This sounds like a wonderful dinner and I say, the more garlic the better! Aw thanks Stef! It has been awhile- so long we now have another baby! We’re huge on garlic in this house, and chicken piccata is one of my husbands faves. I usually stick to the classic recipe, but I’m going to have to surprise him with this more garlicky version next time! He’ll be thrilled. I’m a garlic fiend too, so we both win. Minus the fact that we probably won’t make out that night. Ha! I’m one of those people who reads a recipe with one clove of garlic and thinks “OH…they must mean one HEAD…”. This extra garlicky chicken piccata calls to me for this very reason. I also love that the garlic is roasted. It gives it such a pleasant aroma with the capers that this dish is just asking to be made over and over again. I love chicken piccata as is, but the way I see it, the more garlic the better!! This recipe looks like absolute perfection for a busy weeknight! Belated congratulations on your little one, and a big ol’ head-nod from me on changing priorities and the culinary challenges that come with having a baby. We’re expecting our third soon, and being outnumbered really means that I’m going to be keeping my eyes out for good, delicious, scratch-made food that can be put together in a snap. This is going on the list! Cheers! This is one of our favorite recipes. It is loaded with flavor. It’s easy to make. And you can have it on the dinner table in no time. The extra garlic in the recipe doesn’t overwhelm the chicken, it just spices up the delicious sauce perfectly. So yummy! This recipe is on the schedule this week.